ALL refrigeration appliances must be kept upright while being transported. If your appliance has an ice maker and/or water dispenser you will need a waterline AND the proper connector ends. There are 3 sizes. Make sure that both ends on the waterline fit the fridge and the waterline of the house. If they do not, you will need to go to your hardware store and get a coupler/adapter in order for the line to be connected. Make sure to buy Teflon tape as well. This will prevent even the smallest drop of water from leaking. Most apartment sized refrigerators (top freezer) will fit through just about any doorway. However, when you purchase a side by side or a French door refrigerator, there is a good chance that the doors will need to be removed. Either the door of the house or the doors on the refrigerator. Removing the doors on a side by side and a French door fridge will take some time, about 25 min max to remove and another 25 min to install. Switching the side of the handle. Almost all refrigerators have the ability to have the door handles switched. This is something you will want if the fridge door opens away from the wall and not towards it. When moving a washer and dryer you will need water hoses, gas hook up (if its a gas powered dryer) and a 110/220v electrical plug in. NOTE: Make sure that if you are buying an electric washer/dryer combo unit, you make sure the voltage matches. We have moved appliances for people that find out the hard way. 220v is a much larger plug than your average household plug. And it’s not that easy and cheap to get it converted. You will need to hire a licensed electrician for this. When moving a gas powered unit, you want to not only measure the space to make sure it fits, but also make sure that the gas connectors are the same size. If they are not, don’t worry, all you need is a gas line coupler/adapter/size converter. 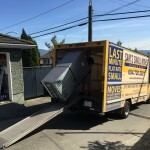 This entry was posted in Small Moves Vancouver and tagged )Entire Condo cleanouts, and Chairs - Party and Event Rentals | Delivery and pick-up Service, Appliance Removal, Bed Removal, Entire household cleanouts (All Furniture, Furniture removal, Household junk removal, Moving Refrigerator | Moving Appliances | Moving a Fridge or Freezer, SMALL Moves / Delivery > Junk Removal > Man & Cargo Van | SMALL to MEDIUM moves | 1 MAN & CARGO VAN SERVICE | Furniture Delivery | Sofa Bed Removal, Sofa & Old Furniture Removal. Bookmark the permalink.